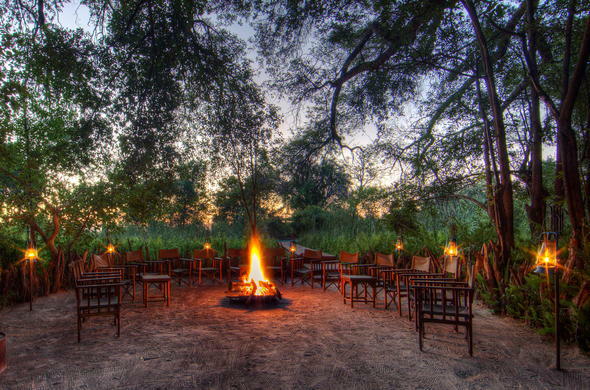 The 5 day Fly-in Classic Romance Okavango and Moremi Package is ideal for honeymooners and couples looking for a romantic escape in the picturesque heart of the Okavango Delta. This romantic vacation includes flights ex/to Johannesburg and has no set departure date. Our 5 day Fly-in Classic Okavango and Moremi Package offers you a romantic and secluded hideaway overlooking the water lily covered lagoons of the Okavango Delta. This Botswana tour is perfect for a stunning African honeymoon, or for couples looking to escape from it all. Pamper yourself with a romantic Okavango safari in a luxury lodge where you will experience excellent service and stay in elegant tented suites. 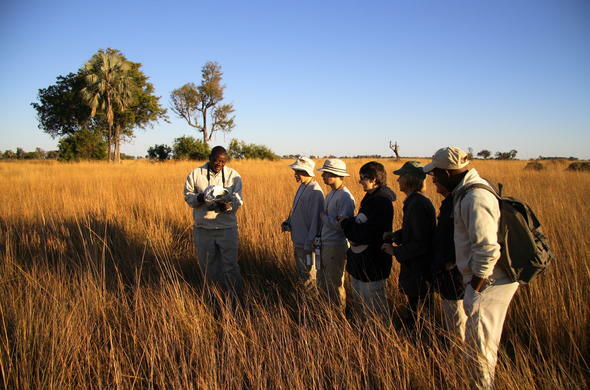 Enjoy exciting game viewing activities that allow you to enjoy the beauty and majesty of this spectacular wetland. 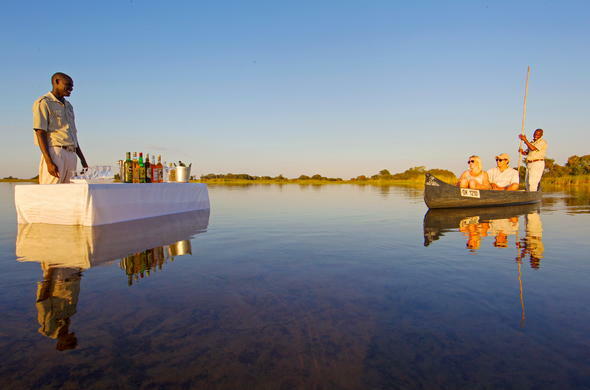 Your camp in the Okavango is perfectly positioned so that you can enjoy intrepid game drives to see an abundance of wildlife, romantic sunset cruises on the lagoon, and guided walks on the picturesque islands. Guided walks are a good opportunity to see some of the areas varied birdlife, including Herons and Slaty Egrets. 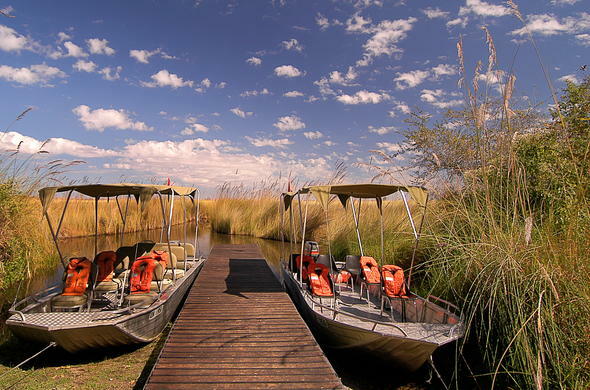 On the first morning of your romantic Botswana vacation, you will fly from Johannesburg to Maun. There you will board a light aircraft that will take you on a scenic flight over the Okavango Delta to your remote bush camp in the Moremi Game Reserve. After being welcomed and settled into your luxurious tented suite, you will enjoy an afternoon game drive, during which you may see large herds of Elephants, Lechwe and maybe even rare Wild Dogs. Afterwards you'll return to camp where you'll enjoy sundowners while watching the spectacular African sunset. This is followed by a romantic candlelight dinner served out under the brilliant stars. Retire to your room and drift off to sleep surrounded by the sounds of the African night. Wake up to the seductive smell of freshly brewed coffee. Enjoy a light breakfast before heading out and tracking game on a guided walk. 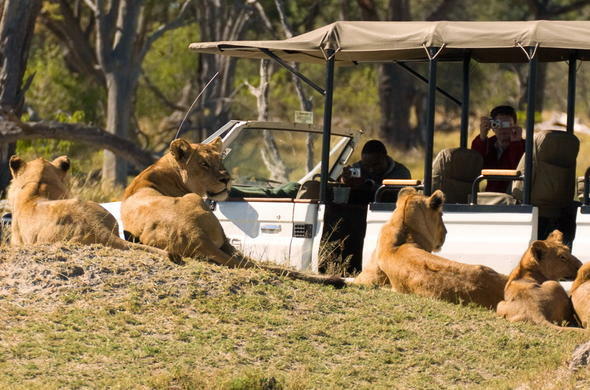 These drives are conducted in open sided safari vehicles and led by highly experienced guides. The area is known for its many predators, and you may see Lion, Cheetah and even Leopards. Return to camp and linger over a tasty brunch, or enjoy a romantic bush picnic on a palm fringed island in the heart of the Delta. Enjoy exploring the lagoon in a motorised boat which is a wonderful way to go game viewing on the islands - you may see Elephant feeding on Ivory Palms and Waterbuck grazing on the floodplains. 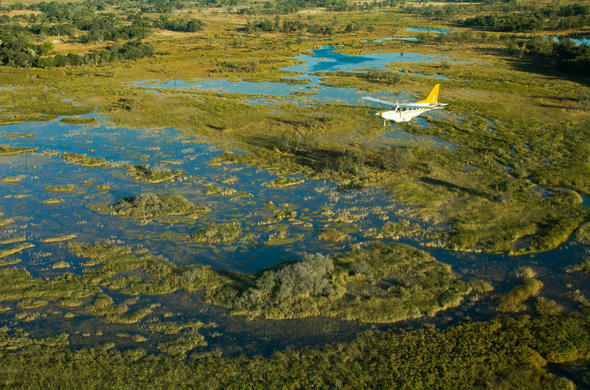 After breakfast, you will catch a light aircraft flight to another bush camp in the north eastern area of the Okavango. Once you have been welcomed and settled in, you will enjoy lunch before heading out to explore the area in a traditional canoe called a mokoro. Glide through the water lily covered lagoons and see African Jacanas treading between the beautiful blue water lily blooms. Hear the grunts of Hippopotamus across the lagoon as your guide poles you around the islands slipping past the thick forests of Papyrus in search of the rare Sitatunga. After returning to camp you can enjoy refreshing sundowners before savouring a delicious African inspired dinner, served either in the dining room or out by the campfire. Retire to the comfort of your tented suite and listen to the sounds of the African night as you drift off to sleep. The sound of a fish eagle may herald a new day. After breakfast you may go on another boating trip or head out on a guided walk to see what animals are on the islands near the camp. You will be led by an experienced guide who will help you read the animal tracks and figure out what went on in the night. The guides will tell you about life in the Delta and about the different animals that you spot. These guided walks are also a great opportunity to see the regions many species of birds. Be sure to look out for rare species such as the Slaty Egret or the more impressive raptors such as Tawny Eagles and Vultures. After lunch you will head out to explore deeper in the Delta in the motorboat. You might even try your hand at a little fishing if you like. Trying to catch the fierce Tiger Fish that swim in the deeper channels is always a thrilling experience. After stopping in a scenic spot for sundowners, you'll return to camp where you will enjoy a sumptuous dinner. This is the final day of your Classic Romancing Moremi Safari. In the morning you will enjoy one last early morning game viewing activity and breakfast in the Okavango Delta. You will be transferred to the airstrip before your flight to Maun and the onward connection to Johannesburg O.R. Tambo International Airport. This 5 day Fly-in Classic Romance Okavango and Moremi package includes flights ex/to Johannesburg for 2 guests sharing en-suite accommodation. This romantic Botswana tour is all inclusive of meals, scheduled activities and light aircraft flights ex/to Maun. This Botswana honeymoon package can be also combined with a stay at Chobe National Park, and a stay in the Savute area. We cannot offer this package to you between mid January and mid March in the rainy season as the camps will be closed. Please ask as for an alternative option at this time.